If you stopped by last week, you saw that I put together a top for a frolleague’s soon to be baby. 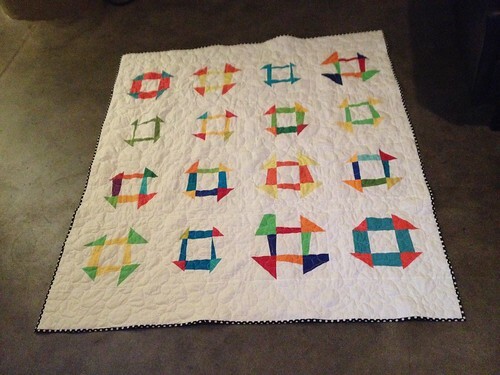 And this week, I’m calling it the former frolleague quilt. Meanwhile, I managed to finish the back for this baby quilt. I could have made it out of nearly one solid length of fabric, but I decided that would be too dull. I generally take the easy way out on backs, so this is a huge deal for me, even if it’s not all that elaborate. Wishing everyone in the US a wonderful Thanksgiving, as well as a Happy Hanukkah to all who celebrate it. Hoping you all make some wonderful memories with your friends and families- and that you also find some time to sew, knit, or otherwise craft! I have a “frolleague” (friend + colleague- saw that word on another blog lately and borrowed it, but can’t remember where I saw it…) who is having a baby, her first, right around New Years Eve. 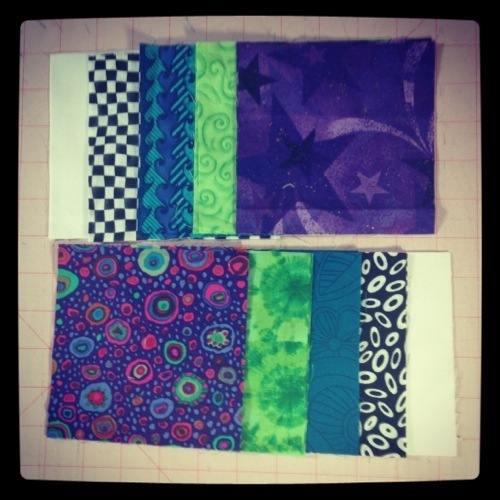 So of course I need to make a quilt! But this frolleague happens to be pretty crafty herself, and also has an excellent and specific sense of color and design. I’ve been dragging my feet about starting the quilt, because I wanted it to live up to some pretty high standards. And of course, she chose not to find out if it’s a boy or girl, so, it had to be nicely gender neutral to boot. 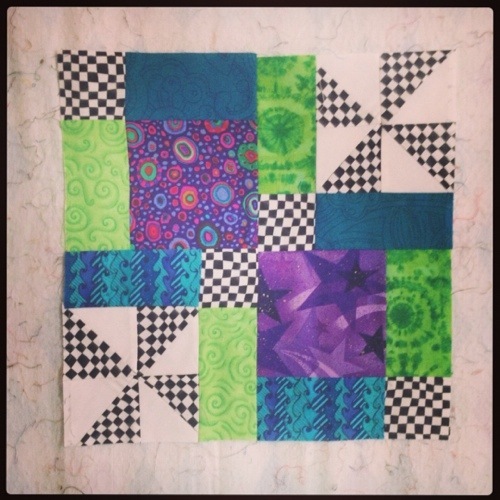 I turned to my trusty Pinterest quilt board, and went through the many tutorials I have pinned. I settled on 3 finalists. Fletcher, Star Bright, and Marmalade Squares. In the end, Marmalade Squares won out, because I had some brownish-grey solid stashed away that was the perfect color for a background, at least for this mom-to-be. 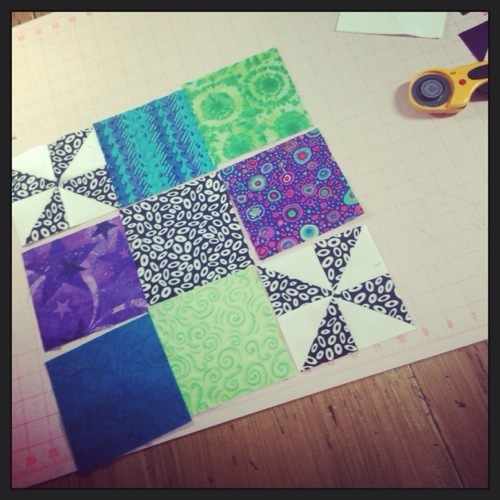 It’s a free pattern on the Moda Bakeshop website, by Katie Blakesley of Swim Bike Quilt. I planned to use the grey for background, and many purples from my stash for the prints. Even if it is a boy, mom loves grey with purple. 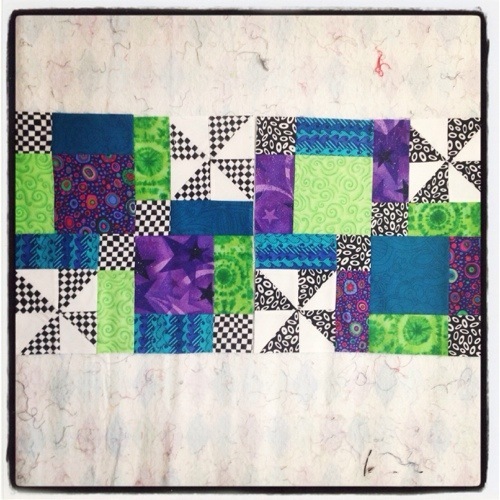 But as I was working on pulling fabrics, it seemed flat, and so I started to throw in greens. You start with a 5×5 grid of 5″ squares, and then start to surround it with background. You also make a little patch for the upper left corner to create an appearance of the strips being woven. I love it! I am so happy with how it turned out, and to get the top done on one Sunday afternoon, well, for me, that’s pretty amazing. Next Sunday is set aside to quilt it. If I can pull that off, and bind it in the following week, it should be done a month before the baby is due. I can do it! I’m thinking purple for the binding- hoping it will balance the whole top nicely. Not yet sure what I’m doing for the back, so, hmm, maybe I need to rethink that schedule I just typed for myself! Wish me luck. Last night, a friend and I went to a super fun event at the Clyfford Still Museum. Everyone needs to check it out- even if you don’t really know who he is. The building by itself is stunning, but the ability to see the collected works of one master, in a sequential order, while learning about his life, is amazing. If you’re in Denver, or coming through Denver, make it a point to go! Don’t you love a party where the centerpieces are art supplies? Believe it or not, I didn’t even realize that Fancy Tiger was sponsoring an activity at the event. I saw a $10 ticket to a place I’d been meaning to check out, which included yummy nibbles AND two cocktails… How could you go wrong? The cocktails from City O City were excellent, and the nibbles from The Populist were to die for. Teeny tiny butternut squash pancakes with bourbon maple syrup and candied pepitas, as well as shots of cauliflower pear soup. Rich and I will have to find a way to dine out there soon. Nom nom nom. I only snapped a photo of one painting, my absolute favorite. When I saw it, I just had to sit down and take time to absorb it. The impact of all that color was stunning. And this is only one teeny tiny corner of one piece. The roving we used was luscious- it took loads of willpower not to just pet it all night. My date and I decided to give our mushrooms polkadots on top. That’s my mushroom posing for photos below the Fancy Tiger samples on their noble branch. Hope your friday was equally fun! 11 months in already? Only one to go? For real? 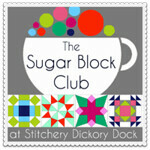 And now, after a Saturday spent binge-watching Top of the Lake and sewing, my November Sugar Block Club blocks are done! I now have a total of 22 blocks, 11 for each quilt. 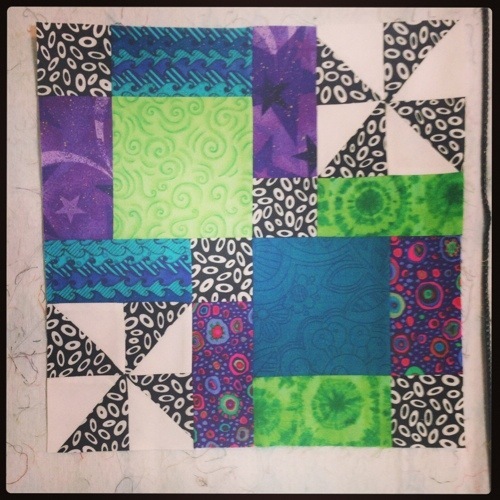 I’m still torn on a few of them- should I go back and re-piece the messy paper pieced February blocks or let it go?